Facebook will soon lean exclusively on solar-generated electricity to power its Prineville data center. Pacific Power and Facebook joined city and county leaders Wednesday morning to announce a partnership designed to spur 437 megawatts of new solar developments, including two projects totaling 100 megawatts in the Prineville area. The news drew officials from Pacific Power and Facebook as well as Oregon Governor Kate Brown to the city hall plaza where Peter Freed, energy strategy manager for Facebook, unveiled future plans. "Today, we are excited to announce that Facebook's Prineville data center will be supported by 100 percent renewable energy," he said. "In partnership with Pacific Power, Facebook is enabling the development of new solar projects on the electric grid serving our data center. Two of those solar projects are located right here in Crook County, and we estimated this projects will increase the amount of solar power in Oregon by more than 20 percent." Freed said new partnership demonstrates Facebook's ongoing priority to leverage renewable resources to power its data centers and find strong partners to help develop solutions. "Our work with Pacific Power to develop new solar resources represents a significant milestone for our hyper-efficient Prineville Data Center. We are committed to supporting 100 percent renewable energy, and we are thrilled to have found a solution for our first data center," Freed said. "We are proud to be a part of the Prineville community and look forward to a continued partnership with the city and the state of Oregon." Pacific Power President and CEO Stefan Bird said the utility seeks out opportunities to power innovation and ideas that bring strength to the cities and customers it serves and provide support for the future. "At Pacific Power, we believe in the power of partnership. As a 100-year company with a long history of serving smaller communities across Oregon, we believe progress is best achieved when business and community come together," Bird said. "We view this partnership as a way for Facebook to meet its sustainability goals and for Prineville and its neighboring Central Oregon communities to grow and thrive, while delivering cost-effective resources to all of our customers." Explaining the partnership, Pacific Power's senior vice-president Scott Bolton said Facebook has paid for a premium of the renewable attributes for six solar projects, two of which include the Prineville Solar and Millican Solar projects. The two local projects are among five yet-to-be-built plants permitted in Crook County off of Millican Road, and once complete, they will join the already-operational 56-megawatt Gala Solar Power Plant. Interconnecting the facilities will not require new construction of the bulk transmission system, Bolton said, and Pacific Power expects the two projects to go online and start serving customers by the end of 2020. The six solar projects included in the new partnership are expected to generate 437 megawatts of electricity — the amount of power necessary to operate Prineville's Facebook data center. "They are basically buying down the cost of that 437 megawatts of new solar generation that will be coming onto the PacifiCorp system," Bolton said. "The renewable energy credits associated with this 437 megawatts are Facebook's — that is part of their end of the deal. The 437 megawatts of energy will flow into PacifiCorp's grid and serve our customers across the West." Bolton went on to stress that without Facebook's leadership, such a significant boost in solar generation would have just been an idea, something Pacific Power would talk a lot about without taking much action. "What Facebook is doing here is going to provide a benefit for the 1.8 million PacifiCorp customers across the West," he said. "Their leadership helps lower electricity costs for everybody on our system." 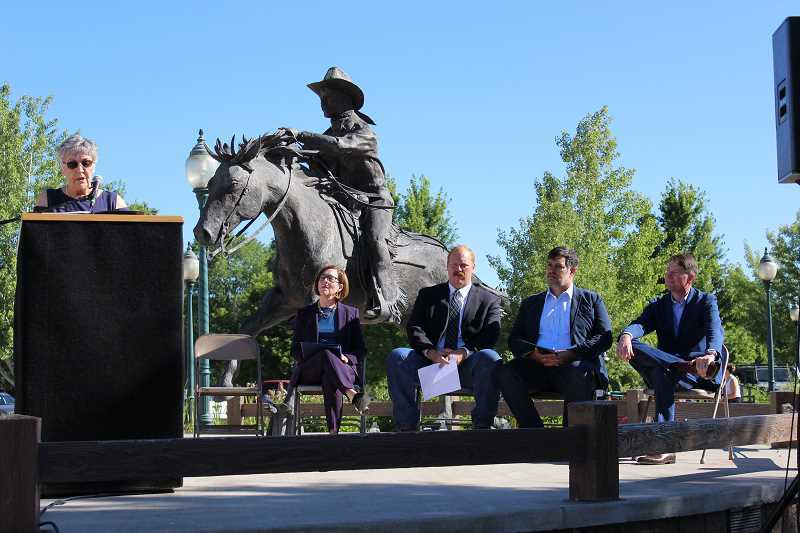 The announcement drew praise from local leaders as well as Brown, who called the partnership between Pacific Power, Facebook and the City of Prineville a pioneering collaboration. "Together, you are providing good jobs. Together, you are providing a pathway toward our students' successes, and together, you are working toward a clean energy future," she said. "I think Prineville is a model for small communities around Oregon." Brown went on to note that through partnerships of this nature, the state is continuing to work toward a vision of "a thriving 21st Century green energy economy for Oregon's future." "This work is critical because the challenge of our changing climate is impacting Oregon's communities, our economy and certainly our way of life." Crook County Judge Seth Crawford agreed that the partnership demonstrates an ongoing pioneer spirit. He pointed out that Prineville long ago took control of its own future when it built a municipal railway and did so again when it recruited data center companies. "Today, we are once again taking our future into our own hands by diversifying the economy," he said. Prineville Mayor Betty Roppe likewise praised the local impact of the data center industry, stating that the community has come a long way since Facebook first arrived in 2011. Unemployment has dropped from 17 percent to 6.5 percent, and the community has added new roads and parks as well as a new hospital and elementary school. "We are expanding from our timber roots to a future with greater business diversity and a workforce with broader skills," she said. "It is through contributions and support from organizations like Facebook and Pacific Power, that Prineville is growing new jobs and strengthening our schools with programs that meet the skills needs of tomorrow. This inspires new paths and opportunities for future generations, right here in town."